If you are looking for a cordless clipper that actually holds a charge for the entire time you are cutting your hair, then Wahl 79600 Lithium Ion Cordless clipper may be just what you are looking for. With a long lasting lithium battery, this cordless trimmer stays charged up to 40 minutes at one time. Lithium ion battery lasts longer than most standard trimmer batteries. Clipper does not have a good grip. The Wahl 79600-2101 trimmer is more than a single clipper, it is pretty much an entire hair cutting kit with both a standard large clipper and a smaller detail clipper as well as a ton of extra accessories. Standard hair clipper for the main workload. Detail trimmer contoured shape and precision edge/self sharpening blades. 15 minute quick charge will allow you to do a 12 minute touch up job. Designed to cut thick hair. Detailed trimmer runs on two AA batteries. Main clipper uses a lithium ion battery. Comes with a soft carrying bag. 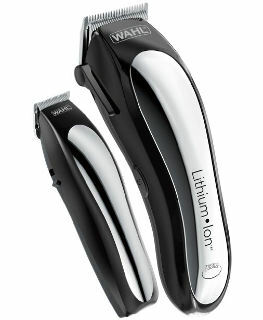 The box containing the Wahl lithium cordless clipper also comes loaded with a variety of other useful tools. Detail trimmer and blade guard. Left and right ear tapers. Full color instructions in English and Spanish. What Uses these Clippers are Good For! Reviews for this cordless hair clipper set are very good and most users feel that they got a good value for their money. Lithium Ion battery lasts a long time. Adjustable head really works great. Does a good job on beards and mustaches. Some users have stated that they really like these clippers but they had some charging issues. The detail clipper uses AA batteries not a lithium ion battery. Clipper does not have good side grips. The majority of users actually felt that the Wahl 79600-2101 is a good clipper at a very reasonable price and they were thrilled to have a dependable cordless clipper.